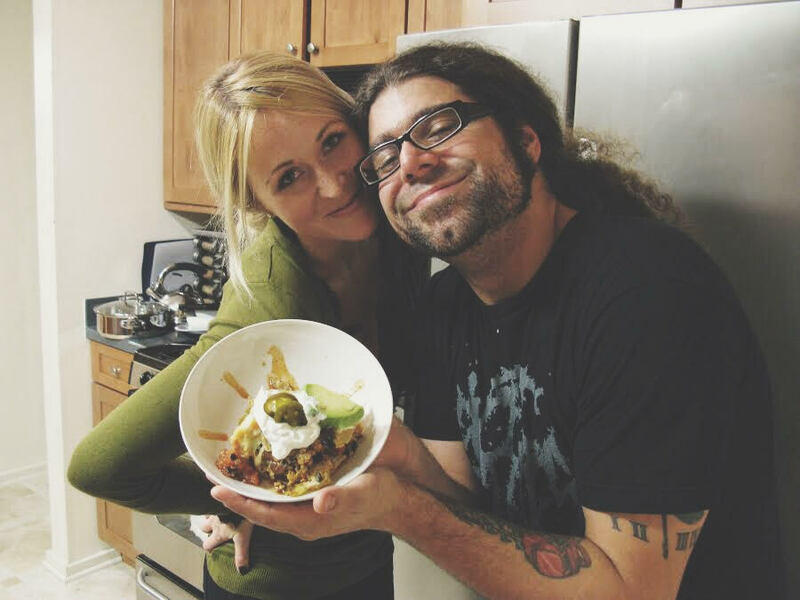 About 6 years ago, Husboy and I were asked to submit a recipe to a rock & roll cookbook called Mosh Potatoes (you can buy it at the end of this post.) Naturally, we decided to share our favorite, a little thing we like to call Nacho Pie. (We even plated it as elegantly as possible for 2009, as evidenced above.) Every single time we come off a tour, it’s the very first thing we make to celebrate being home and bask in the luxury of being together again, in one place. It’s also a time to celebrate multiple layers of delicious, melted cheese. A few days ago Husboy surprised Atty and I by coming home from a European tour a day early. 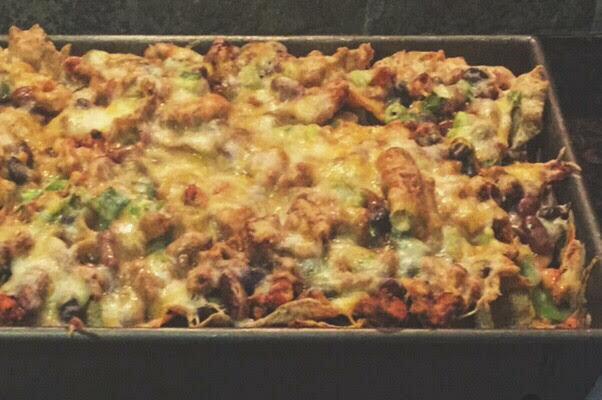 Naturally, we kicked off his triumphant return with a tray of this cheesy, bean-speckled magic. After posting a pic on my Instagram story, I received an influx of messages requesting the recipe. So here it is, my friends. Sanchez Nacho Pie. All I ask is you make these for the happiest, coziest days of your life–and for goodness sake, don’t skimp on the cheese. Heat a nonstick skillet over medium. Add oil and garlic, sautee for one minute, then crumble in ground turkey. Season with one packet of Sazon, cumin and chili powder, mixing occasionally with a wooden spoon. While the turkey cooks, heat the red beans, black beans and remaining Sazon packet together in a large saucepan over medium heat, stirring frequently, for about 8 minutes or so. When meat is browned, add the cooked beans to the skillet and stir gently together. Add the green onions to the mixture. In a 9 X 13-inch pan, arrange one layer of chips (about half the bag.) Cover with half the meat and bean mixture and cheese, so there are two layers. Bake for 5-10 minutes, until cheese is melted and bubbly. Enjoy immediately with optional goodies, a Corona and Netflix.